Tim Moore serenades his dream girl in a scene from Guys On Ice at the Pagosa Center for the Arts. The ice-struck lakes of Wisconsin where bearded fishermen with ridiculous accents drill wishing holes may seem as foreign as a Packers fan in Pagosa Springs (especially this week). But Guys On Ice, an ice-wishing musical which opened Friday at the Pagosa Center for the Arts, is a sensational effort to acquaint audiences with the fisherman in all of us. The 2-year old Thingamajig Theatre Company production offers a superb rendition of a less-than-superb script. Perhaps the continued revival of Guys on Ice is not because of its originality (how many times can you hear that same fish joke? ), but because of how much fun it must be to perform. Actors Tim Moore (Marvin), Brooks Linder (Lloyd) and Robin Hebert (Ernie the Moocher) bring an energy to the stage reminiscent of a playground full of 5-year-olds. In such an intimate space, the audience cant help but have fun with them. And that is certainly this productions strong suit  the acting. Moore, also the artistic director for Thingamajig, uses his whole, plump body in his snowsuit to bring a dynamic physicality to his role as a star-struck, lovelorn fisherman. His voice, well-suited for musical theater, harmonizes beautifully with that of Linder. Linder, perhaps better known as Brooks-i of the Pagosa band Ebenezer and the Crooked Hookers, gives a humorously subdued and occasionally incredulous performance that perfectly counterbalances Moores antics. 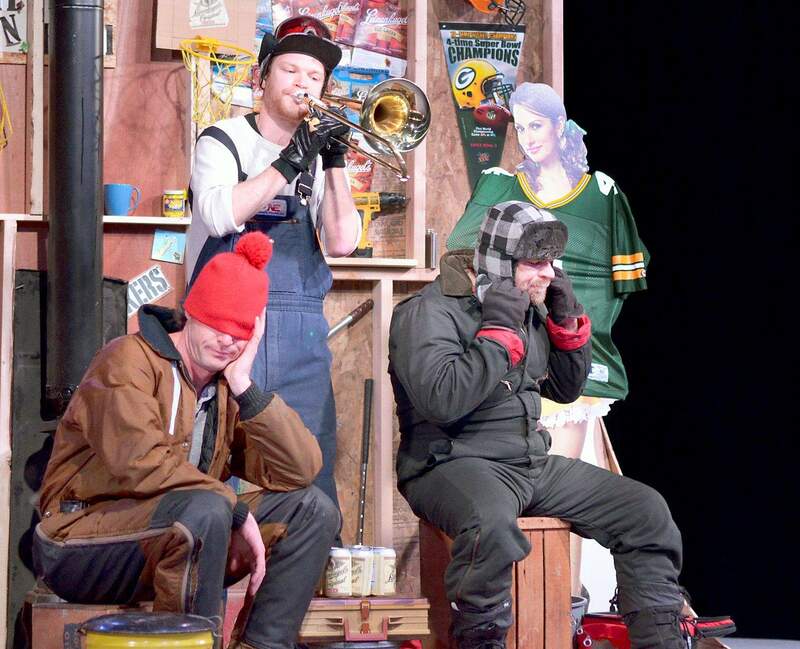 Under the superb direction of Laura Moore, Linder and Tim Moore banter flawlessly and appear perfectly at home in their ice shanty  especially when the obnoxious, but lovable Ernie the Moocher, stops by to get a beer. Moores direction fails only when her actors leave the shanty to perform on the ice. With the exception of a hilarious dance scene, the actors lose their sense of purpose without the use of props. Many scenes feel overacted because of the lack of conflict in the script. Writers Alley and Kaplan rely on their audiences desire to laugh at funny accents and well-worn fish jokes. Despite the scripts flaws, Guys on Ice stands out as a phenomenal production on par with any small theater in a major metropolitan area. If the Pagosa Center for the Arts keeps it up, the venue will become known as a first-class destination for performing arts in the Four Corners. The Thingamajig Theatre Company presents Guys on Ice, by Fred Alley and James Kaplan, directed by Laura Moore. Performances are at 7 p.m. Friday, Saturday and Jan. 27 and 28; also 2 p.m. Sunday and Jan. 29 at the Pagosa Springs Center for the Arts, 2313 Eagle Drive. Tickets cost $18 in advance, $25 at the door, available by phone at 731-SHOW or online at www.pagosacenter.org.